Saw this on Saturday morning at a preview screening. It was okay. As a standalone film it would have just about worked, nothing too ground breaking and too much CGI. Having just read the book, however, there were a few too many departures from the story. I realise they were trying to slim down events that took place over years in the book to a few days in the film, but the first quest was totally different. And naff imo. If the film bores you, try spotting all the licensed properties in the background. Or foreground. The main character drives a Doc Brown-ified DeLorean. There's a Firefly class spaceship at one point. The Iron Giant gets a look in. There's a whole scene inspired by The Shining as well. Plus loads of other stuff. The book is on my "to read" shelf. Maybe I'll see the film first then enjoy the book more, like I usually do. I listened to the audiobook. It was pretty good. Wesley Crusher narrated it. I liked it. Especially the bits about Atari Adventure and Joust! You will feel let down by the film then. My interest in this film ended with this (real) passage from the book. Yeah, I had a friend recommend it to me, and I have it on my Goodreads to read list, but when I started reading actual things from the book, I wasn't interested any longer. I especially like* how he manages to hammer the obvious references home time after time after time but doesn't do it with "oscillation overthruster" - probably because he has no idea what it is from, just heard it as cool from somewhere. But I will definitely agree, it's not 'literature'. 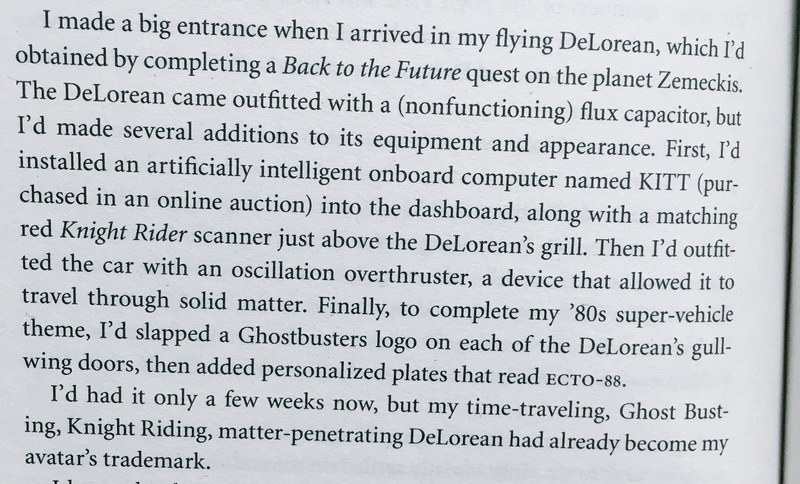 My verdict on the book was that one day there was this nerd who woke up and realised that everything he obsessively cared about was worthless garbage that had no cachet and would never be able to provide him any kind of reliable income. So he wrote a book where all that useless knowledge was suddenly the most important and valuable information in the world. It's basically a wish fulfilment fantasy for a lonely middle-aged geek. I did enjoy reading it but wasn't particularly interested in seeing the film until Mrs Thistle scored us some preview tickets. Saw this today- disappointing apart from Rylance. And I know I should expect nothing else from Hollywood adaptations but if that actress playing Art3mis is “rubensesque” I wouldn’t like to see a skinny one. I took my 11 year old son last Saturday morning (which seems like an apt time, in retrospect) and it was an engaging enough piece of enjoyable nonsense. Neither of us know the book, he was more up on the gaming themes whereas I got the eighties references (I particularly enjoyed the use of ‘We’re Not Gonna Take It’ by that decade’s greatest band, Twisted Sister). The sum of it all is possibly not commensurate with the acting, directorial and visual effect talent (and money) that’s gone in to it (and it was eclipsed by seeing ‘Infinity War’ next day) but it’s a diverting romp, nonetheless. TJ Miller’s I-Rok is a great minor character too. Nothing I’ve seen since about the book (especially the passage upthread) really draws me to it but I’d give a qualified recommendation for the film. All times are GMT. This page was generated at 01:51.